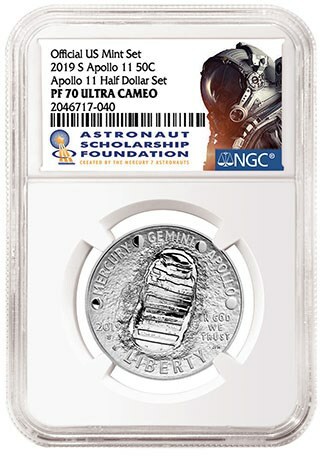 The Apollo 11 coins celebrate a nation’s determination, scientific achievements and pioneering spirit. In the early 1960s, it was painfully obvious that the US was losing the Space Race. The Soviet Union had launched the first satellite (Sputnik in 1957), the first unmanned spacecraft to the moon’s surface (Luna 2 in 1959) and the first person to orbit the Earth (Yuri Gagarin in 1961). In the months after his inauguration in 1961, President Kennedy decided that a manned mission to the moon was necessary, not only to restore national pride but also to keep pace technologically with the its Cold War rival. That year, in May, Kennedy asked Congress to support the enormously expensive undertaking in a special message. In September, he gave a speech in Texas in which he famously said: "We choose to go to the Moon in this decade and do the other things, not because they are easy, but because they are hard; because that goal will serve to organize and measure the best of our energies and skills, because that challenge is one that we are willing to accept, one we are unwilling to postpone, and one we intend to win." The Mercury Program brought the US its earliest successes with manned spaceflight. In May 1961, the Freedom 7 mission lasted a mere 15 minutes, but it was enough to make Alan Shepard the second person—and the first American—in space. In February 1962, Friendship 7 made John Glenn the third person to orbit the Earth, and the first American. The six manned Mercury flights, each with a single American on board, wrapped up in 1963. But the Soviet Union continued to reach milestones first, including the first spacecraft to carry a crew (Voskhod 1 in October 1964) and the first spacewalk (Voskhod 2 in March 1965). 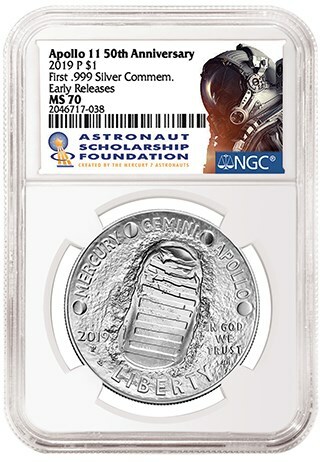 The Americans responded with the 10 manned missions of the Gemini Program in 1965 and 1966. These two-man missions accomplished a series of complex tasks in Earth orbit that would set the stage for the moon missions a few years later. Gemini 5 tested astronauts’ endurance with the first weeklong flight. On Gemini 8, on their first mission into space, Neil Armstrong and David Scott achieved the first orbital docking. By 1967, the Americans' Apollo Program and the Russian's Soyuz Program both seemed well-positioned to catapult their respective nations to the moon. But that year, a pair of tragedies underscored the dangers inherent in space exploration. In January, during a dress rehearsal on the launch pad in Florida, a fire in the Apollo 1 capsule killed the three-man crew. Meanwhile, the lone Russian aboard Soyuz 1 died when his capsule crashed on re-entry in April. It was clear that both programs needed significant improvement. Manned spaceflight did not resume until October 1968, with Apollo 7 and Soyuz 3. On Apollo 7, Walter Schirra, Donn Eisele and R. Walter Cunningham helped the Americans regain their footing with a 10-day mission in Earth orbit. Apollo 8 was the first manned mission beyond the Earth, with astronauts Frank Borman, James Lovell and William Anders achieving lunar orbit on Christmas Eve 1968. Other highlights of the mission included a series of television transmissions from the crew, as well as the famous Earthrise image of the Earth, appearing as a blue and white marble, floating over the horizon of the moon. In March 1969, the Apollo 9 crew orbited the Earth for 10 days, testing the Lunar Module. The moon landing depended on the complicated choreography required to separate this module from the spacecraft so it could descend to the lunar surface, before relaunching and rendezvousing with the rest of the spacecraft. In May 1969, these maneuvers were tested once again, this time in lunar orbit by a crew consisting of Thomas Stafford, John Young and Eugene Cernan. The crew gave lighthearted nicknames to their Command Service Module and and the Lunar Module: Charlie Brown and Snoopy. The lander got as close as a few miles to the moon’s surface. Thus, the stage was set for the crew of the Apollo 11 crew: Neil Armstrong, Buzz Aldrin and Michael Collins. Mission commander Armstrong was a 38-year-old Ohio native, a Navy veteran who went on to a distinguished test pilot career and who was now a civilian. On his only other trip to space, he saved the Gemini 8 mission when the capsule tumbled out of control due to a stuck thruster. NASA Photograph of the Apollo 11 crew, from the Armstrong Family Collection™ and certified by Collectibles Authentication Guaranty (CAG), an affiliate of NGC. 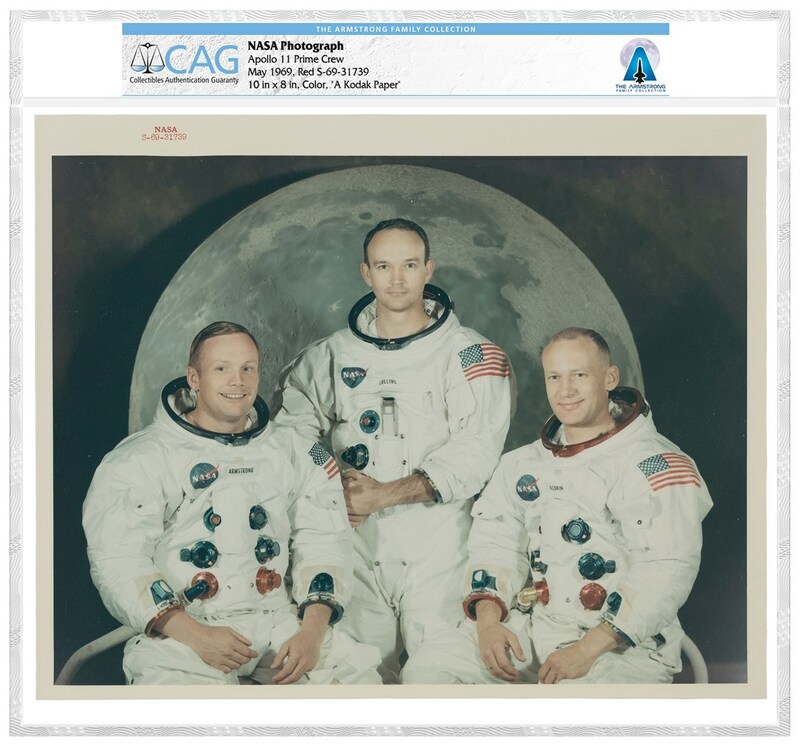 From left are Neil Armstrong, Michael Collins and Buzz Aldrin. Aldrin was a 39-year-old New Jersey native who had served in the Air Force his entire career. On his only other mission, Gemini 12, he had demonstrated his mastery of spacewalking. Collins, like Aldrin, was a 39-year-old Air Force serviceman. On Gemini 10, he gained valuable experience rendezvousing with two target vessels and conducting a spacewalk at each. As the pilot of the Apollo 11 Command Module, Columbia, he was tasked with keeping vigil in orbit of the moon while his crewmates descended to the surface. By the time their rocket was being assembled in Florida in early 1969, NASA had already selected the friendly terrain of the Sea of Tranquility as the primary target for the landing. An earlier draft of the Apollo 11 mission insignia, showing an eagle approaching the surface of the moon with open talons, was replaced by a more serene version in which the eagle clutched an olive branch, symbolizing peaceful intentions. The eagle theme was carried over to the call sign used for the Apollo 11 Lunar Module. On July 16, 1969, with the help of a massive Saturn V rocket, the Apollo 11 mission blasted off from the Kennedy Space Center. Four days later, Armstrong and Aldrin entered the lander and descended toward the lunar surface. A computer glitch set off alarms, but it was determined not to be a threat. But finding a safe place to land on the lunar surface was challenging, and Armstrong was running low on fuel to maneuver with. 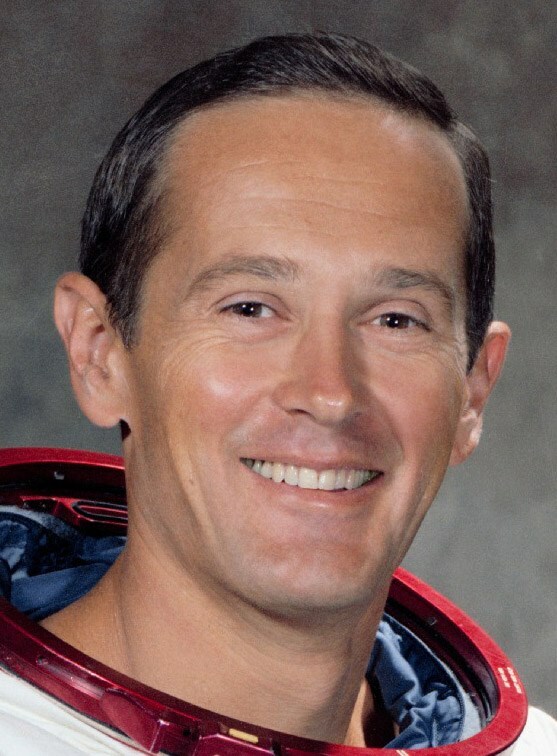 Fellow astronaut (and future moonwalker) Charlie Duke back on Earth responded to Armstrong: "We copy you on the ground. You've got a bunch of guys about to turn blue. We're breathing again. Thanks a lot." the historic landing scene reflected in the curved visor of Aldrin’s helmet. 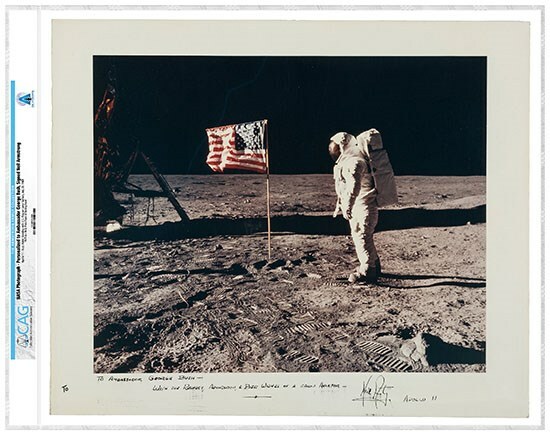 NASA Photograph of Buzz Aldrin on the moon, from the Armstrong Family Collection™ and certified by CAG. As a reminder of the intensity of the Space Race, an unmanned Soviet probe crash-landed on the moon while Armstrong and Aldrin were still on the surface. The probe, had it been successful, would’ve returned the first Soviet lunar samples. After the Apollo 11 mission, the Soviet Union – which never got anyone beyond Earth orbit – focused its attention on launching the world’s first space station. NASA went on to land 10 more men on the moon through December 1972. They included Duke, who at age 36 became the youngest person to walk on the moon; today he is 83. The three men splashed down in the Pacific Ocean on July 24, 1969, fulfilling Kennedy’s vision not only for the timeframe but also for the safe return to Earth. President Nixon flew to the aircraft carrier that recovered the crew in the Pacific Ocean to greet them in person. NASA Photograph of President Nixon and the Apollo 11 Crew in Quarantine, from the Armstrong Family Collection™ and certified by CAG. The US basked in the glow of its historic achievement. The astronauts were celebrated as heroes and, after being released from quarantine, they were sent on a global goodwill tour. 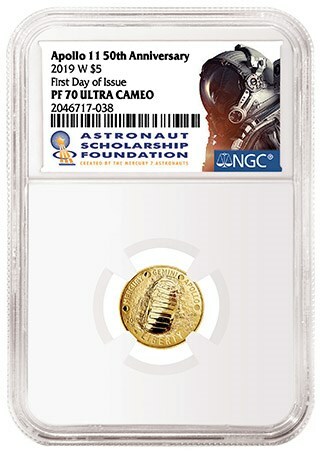 The mission was celebrated in a variety of ways, including on the nation’s coins. The mission insignia, showing the eagle with the olive branch, was adapted for the reverse of a US dollar coin issued starting in 1971, with former President Eisenhower on the obverse. Now, 50 years after the Apollo 11 mission, the US is again honoring this towering feat on its coinage. Commemorative coins, available in gold, silver and clad, are proving to be some of the most-sought-after collectibles in years from the US Mint. Special curved planchets help highlight the design, which features two of the iconic images from the mission. 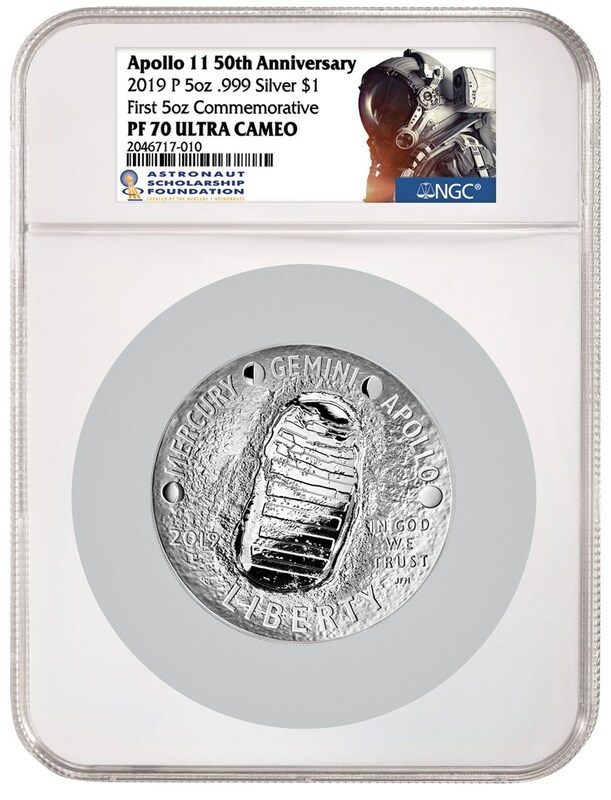 A bootprint in the lunar dust appears to sink into the concave obverse, beneath the names of the three American space programs that laid the groundwork for that moment: Mercury, Gemini, Apollo. 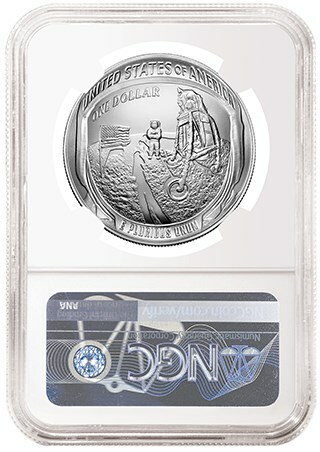 The convex reverse was inspired by the image showing the reflection of the lunar landing scene in Aldrin’s visor. 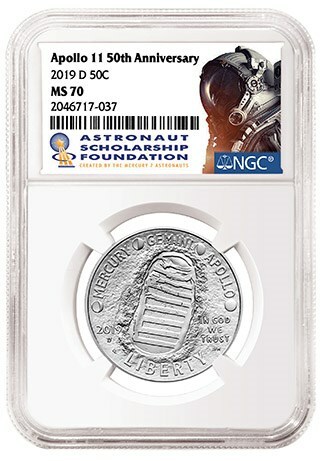 The 5-ounce silver version of the 50th anniversary commemorative coin proved especially elusive to collectors, as it went on back order just a few minutes after it was made available to the public. 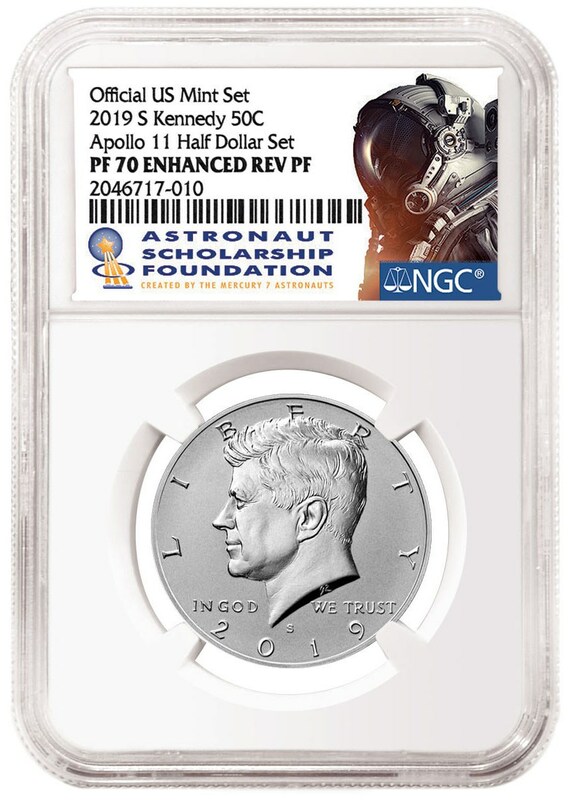 In a nod to President Kennedy’s role in promoting the Apollo Program, the US Mint also issued a special set featuring one Kennedy Half Dollar (the first of its kind in an Enhanced Reverse Proof format) paired with an Apollo 11 50th Anniversary Commemorative Half Dollar Clad Proof. 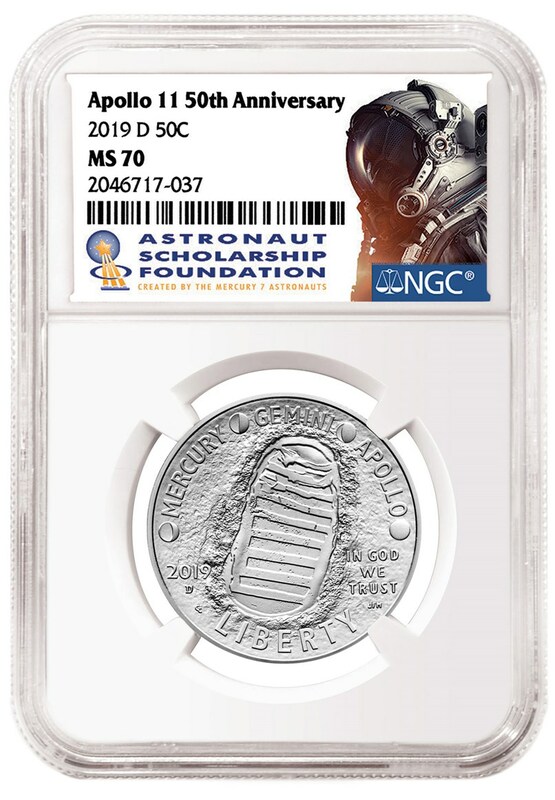 Each of the Apollo 11 50th Anniversary Commemorative Coins carries a surcharge, half of which benefits the Smithsonian National Air and Space Museum’s “Destination Moon” exhibit. The educational endeavor, which includes the Columbia command module, wraps up a four-city tour in Seattle this spring and summer. The remaining proceeds benefit the Astronaut Memorial Foundation and the Astronaut Scholarship Foundation, the latter of which also benefits from the special label that NGC created for use with the Apollo 11 coins. 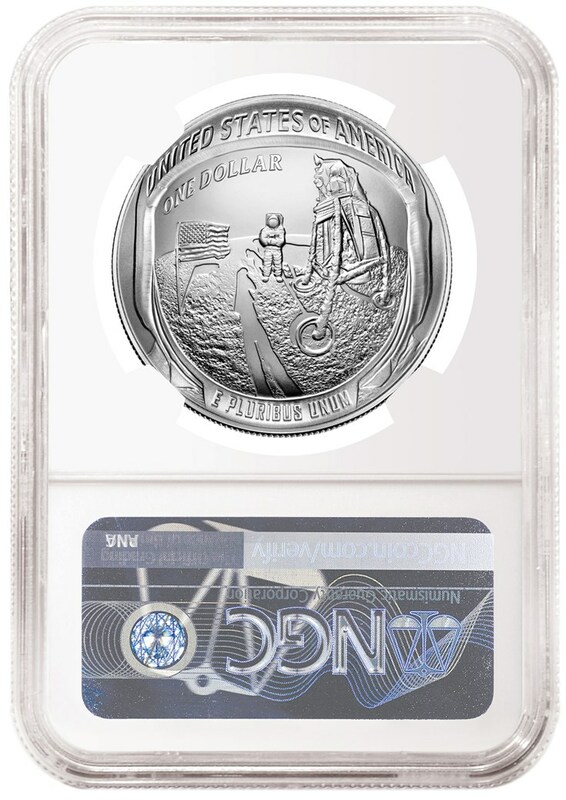 Hopefully these coins and the renewed interest in America’s space program that they helped to foster, will bring the next triumphs in space a little closer to reality.